← St. Peter Canisius, pray for the Jesuits! The title of this book intrigued me from the start, since it is a phrase that I have written many times. It came out last year (I’m surprised that I wasn’t alerted, frankly). 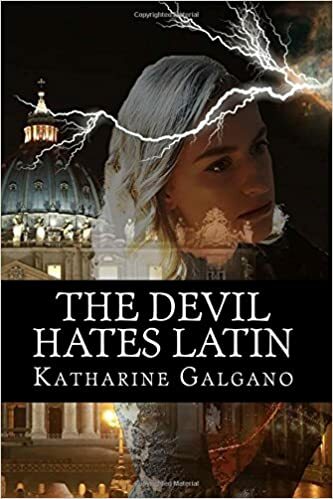 The Devil Hates Latin by Katherine Galgano (which strikes me as a nom de plume). Here is a quick read which will appeal immediately to the more traditional among you, but which could be a strong cup of wake up for the more liberal among you. It strikes me as having been written with a heavily female ex-pat perspective, which is fine. Women stress some things that men don’t. As someone who lived in Rome as long as I did, I see what’s going on pretty easily and she get’s a lot right. The plot takes a while to develop, as many characters are introduced one by one, each one having grim circumstances. It’s hard, at first, to see how the threads will eventually come together. But with a title like The Devil Hates Latin you wouldn’t expect fluffy kittens and dancing smiley flowers. Much like Malachi Martin does in Windswept House (US HERE – UK HERE) she creates not very subtly veiled characters, such as Alexander Card. Portland, described as “an intelligent bishop who actually believed” and “the real thing”. He is a composite. There is an African Pope (a good guy). The conclave dodged a German and “a Filipino with an infectious grin”. A good thing in the book is the emphasis on how people get into serious spiritual trouble and what sort of disasters result from liberalism and indifferentism in the Church. There is a very strong defense in the book of the unborn, while describing some sad circumstances. Many of you will enjoy this quick read. This is a Non Sequitur from the post, but I thought you may find it interesting. My ten year old reported to me that when he was trying to pray the rosary one night, Our Lady kept interrupting him saying, “Say your prayers in Latin” or some thing to that effect. He knew the Hail Mary, but wanted to learn ALL of it in Latin. He’s not a child given to making up stories….his little brother, if he’d have said it I would have just raised my eyebrows and kept going, he’s a little B.S.er…..definitely our future lawyer! But Paddy is a straight shooter. This entry was posted in REVIEWS, The Campus Telephone Pole and tagged book, devil, Latin. Bookmark the permalink. I’ll always be grateful to the late Malachi Martin for arranging me to meet Pope St. John Paul II in the Vatican in June 1994, prior to His Holiness’ general audience. I still have the white rosary beads I was given. – There is so much graffiti everywhere! On the walls of old palazzos, churches, apartment buildings and shops. Romans don’t bother to clean it up anymore. – The rubbish: it’s everywhere! Municipal rubbish collection is run by the Mafia, so you know already what that means. They collect the money from the state, but don’t collect the rubbish. – The Rome subway is so dirty and dilapidated that it looks like the entrance to Hades! – Roman men and women used to be elegantly dressed. On previous trips to Rome, I would marvel at how vain Italian men were, with their perfect hair, perfect shirts, matching trousers, shoes and sunglasses. Now, one sees a LOT of Italian men and women (including people in their 50s) sporting big tattoos all over their arms, legs, and neck, wearing sloppy ugly clothes. How did this tattoo trend blow over into Italy? – Empty Roman churches on Sunday: no one believes me when I tell them that I found Paris churches to be quite full in contrast to churches in Rome (or churches in Italy in general – and I’ve traveled all over – to Sicily, Puglia, Alto Adige, Piemonte, Campania). The exception would be Assisi which draws many pilgrims, who do attend church on Sunday (NOTE: Assisi is a touristic place of pilgrimage with law and order imposed by the beefy, bouncer-like Franciscan priests, so no selfie-stick vendors or pickpockets running wild). Father Z, when was the last time you visited Rome? What do you think? I’m sure when you lived there it was not as bad as it is today. Alexander Cardinal Portland? Let me guess: Archbishop Alexander Sample of the Archdiocese of Portland? There is a nonfiction book of the same title by a classicist whose name I can’t remember now. Very good. Analysis of Clint Eastwood films according to classical canons of narrative and form. I just finished reading this over the weekend. I think that other than the author needs to work on her transitions it was good. I certainly enjoyed it. The Kindle version is only $2.99 right now. Paperback is $9.99. If nothing else, I bought mine to show support. She practically named called him by name. Her description of him is right too. Interesting book and update, thanks Fr. Z. The parish priest at the parish where I assisted the Triduum had introduced the Lent Prose (“Attende Domine”) to the Sunday Masses during Lent. One of the parents reported just before Holy Week that their young daughter had been singing the hymn at home. The devil may hate Latin, but children seem to love it! I read this book today. I agree with one of the above posters that some of the transitions could use some work, but I loved the book. N B: There is little quite so irritating as the celebrant trying to sing in English to music in chant. Gregorian Chant was instituted precisely because of simple form that pairs perfectly with Latin. Unfortunately they keep trying. Got it, read it a day, couldn’t put it down.